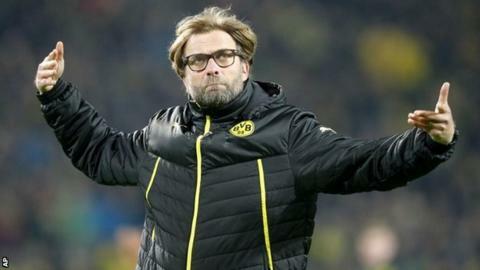 Borussia Dortmund boss Jurgen Klopp says their near-comeback against Real Madrid can be a template for other teams chasing big deficits. Real won the Champions League quarter-final first leg 3-0 in Madrid but Marco Reus scored twice as Dortmund won the second leg 2-0. "You could make a video of this game and show it to the teams that lose a first leg 3-0," said Klopp. Dortmund reached last year's final, beating Real in the last four. Klopp felt that Real Madrid midfielder Xabi Alonso was fortunate not to have been sent off for a second booking when he tripped Henrikh Mkhitaryan early in the second half. "I think the game had one crucial moment when Alonso committed a tactical foul that should have warranted a yellow card," he said. "And if you are already on one, you should get sent off. That was after 52 minutes. And with the power we showed, it would have become very difficult for Real Madrid. "We put Real under so much pressure that they needed to resort to means they usually don't need to." Klopp, whose side are 20 points behind German and European champions Bayern Munich in the Bundesliga table, did not blame Mkhitaryan for squandering several chances, including hitting the post after rounding keeper Iker Casillas. "He put in an outstanding performance," Klopp said. "He had two moments that every player has to go through in his career - especially in a phase where scoring goals doesn't come easily. "It would be great if we could look at the game as a whole and not only at the two missed chances. We had a few others - and five clear-cut opportunities in the first leg. Had we scored there, a 2-0 would have seen us through. Out of a million possibilities to go out, this was still the best." Real Madrid missed an early penalty in Dortmund and boss Carlo Ancelotti said: "After the missed penalty, we got scared. The first half was hard. "At the break I didn't have to give them a stern talking to. The side was sad, low on confidence, they needed animating and we changed a little, putting Gareth Bale on the right and Isco on the left. Things got better in the second half. "They tried everything. We helped to open the tie up but luckily we're in the semi-finals and that's good. I think the side is all right and it might be that, to improve, we needed to have a game like this and suffer."